After the cliffhanger ending of The Thickety: A Path Begins, I can't believe it took me so long to get to this sequel to find out what happens to Kara and Taff! When we last left them, they were fleeing their village and headed into uncertainty in the Thickety. 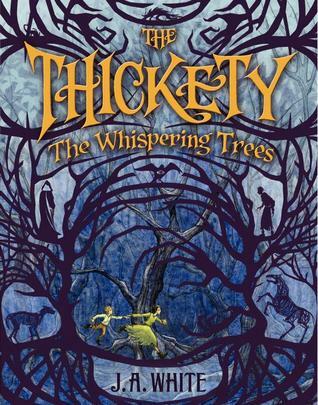 When the book picks up, they promptly meet danger, Sordyr, and another witch named Mary Kettle, who offers Kara and Taff safe passage through the Thickety and magic lessons for Kara. The children hesitantly agree--only because they have no other choice. Kara learns that she is a special kind of witch, wexari, who doesn't need a grimoire in order to wield magic. That makes her more powerful, and more dangerous--if she chooses to be. As the children encounter death, betrayal, and the darkness behind Sordyr and his powers, the responsibility to use her magic carefully weighs heavily on Kara, and she is forced to make impossible decisions, with shocking consequences. The second book moves quickly, much like its prequel, and explores weighty themes of redemption and responsibility of power. Kara and Taff both grow, in ability and in character. The losses and betrayals they experience up the stakes, and make an already convoluted plot even more tangled than the darkness they traverse in the Thickety. They must rely on each other and what they know about human nature in order to figure out what to do next, and grapple to maintain hope in the face of all that they've lost. White's plotting is impressive, with some great twists, and the stakes are raised impressively with this second volume. 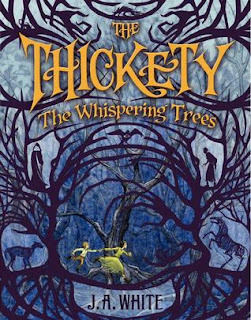 The mythos of the Thickety and the magic also develops in surprising and interesting directions, which gives the story depth and history. While the ending isn't quite as nail-biting as the prequel's, it definitely sets us up for a third installment, which will be out in February 2016. Book purchased from local indie! Wow. I didn't know about the first book! This sounds right up my alley. I need to find book 1.